In the 1860s an amateur archaeologist named Sidney S. Lyon mapped several mound groups in the Wabash/Ohio areas, including more than forty mounds at what is now called Slack Farm (Arden 1989: 385). Slack Farm is a mound and village site which is located on the Ohio River near the mouth of the Wabash River, a few miles outside of Uniontown, Kentucky. It dates to approximately 1400 to 1650 AD and is one of around eighty archaeological sites in the area that are associated with the Caborn-Welborn culture (a Late Mississippian culture). 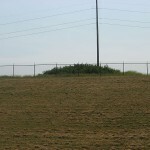 The site has seven discrete zones each with its own cemetery. Burials at Slack Farm contain grave goods such as body adornments and pottery. The site is named after the Slack family who had owned the property for a number of years. The Slack family is thought to have discouraged illicit digging on their property (Fagan 1988), and the site was thought to be relatively safe in their hands. Although most other Mississippian sites in the area had been hit by looters by the late 1980s, Slack Farm had remained largely intact (Fagan 1988). Following the death of a member of the Slack family, however, the land became the property of another owner who leased it to two tenant farmers. While some evidence indicates that the Slack Farm tenants attempted to keep looters off the property, in the autumn of 1987 a group of ten pot hunters from surrounding states paid the tenants of Slack Farm $10,000 for permission to loot the site while the fields were lying fallow (Fagan 1988). At least 650 graves were opened by the looters over the course of two months, some with the help of heavy machinery (Arden 1989). Eventually concerned neighbours complained about what they saw as a large-scale looting operation which had exposed human burials. Although the looting took place on on private land, any discovery of human remains in Kentucky had to be reported to state authorities; allegations of disinterments prompted an investigation (Arden 1989: 378). When Sergeant Miles Hart of the Kentucky State Police arrived at Slack Farm to respond to the complaint, he was prevented from entering the property by two of the ten looters. Upon obtaining a search warrant, the looters stated that the area was an ancient campsite, that they had found no human remains, and that they were within their rights to dig on private property. Yet scattered human remains were clearly visible scattered between around 450 looters holes and Hart returned with a cease and desist order, effectively stopping the looting in December of 1987 (Arden 1989: 378). The looters were arrested and charged by a Union County grand jury with a crime applicable in the state of Kentucky at the time: that of ‘desecrating venerated objects’, in this case human burials (Fagan 1988). In 1987 ‘desecrating venerated objects’ was a misdemeanour in Kentucky and a conviction under that charge would only have resulted in a small fine (Hicks 2001). Four of the ten men were residents of Illinois or Indiana and could not be extradited for a misdemeanour (Arden 1989: 380). The misdemeanour charges were dismissed in March of 1990 for lack of prosecution (Lucas 2007). As a result of the looting of Slack Farm, the state of Kentucky elevated grave desecration from a misdemeanour to a felony offence (Hicks 2001; Lucas 2007). Slack Farm is often cited as an inspiration for the 1990 Native American Graves Protection and Repatriation Act (NAGPRA) (for example Davis 1998), however NAGPRA only applies to Native American burials on federal land. The Slack Farm burials were located on private property and would not have been protected by NAGPRA. That said, Native American Groups have played a significant role in the activism following the looting of Slack Farm. 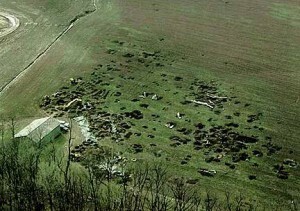 Several groups claimed the human remains from Slack Farm under the “friends of the deceased” provision of Kentucky state law, a claim that was recognised by the State Medical Examiner (Arden 1989: 386). This has resulted in the reinterment of most of the human remains recovered from Slack Farm. Arden, Harvey (1989), ‘Who Owns Our Past?’, National Geographic, 175 (3), 376-92. Davis, Hester (1998), ‘Facing the Crisis: Looting in the US’, Archaeology Online Features. < http://www.archaeology.org/online/features/loot/>, acessed on 2 August 2012. Fagan, Brian (1988), ‘Black Day at Slack Farm’, Archaeology, 41 (4), 15-16; 73. Hicks, Robert (2001), ‘Time Crime: protecting the past in the United States’, Culture Without Context, 9, 24-29. Lucas, John (2007), ‘A Call for Spirits to Sleep’, Currier Press, 6 May.